As a well-known fact, volcanism provides favourable conditions for the fossilisation of terrestrial habitats. The cloud from an eruption may cover everything with a layer of volcanic "ash". This layer contains fine-disperse silica which is leached by rainwater and precipitated on the decaying organic matter trapped below (Fig.1). Most of the petrified wood had been formed in this way. The leaching of silica from volcanic deposits continues for a long time. Swamps with new vegetation are fed with silica-rich water which may turn into silica gel as it mixes with the low-pH swamp water. While more silica enters into the gel by diffusion and replaces the water there, the whole swamp matter, including water, mud, microbes, swamp plants and trees, and creatures, too, may finally turn into chert (Fig.2). Samples silicified in volcanic deposit turned into tuff and those silicified in swamp matter turned into chert may occasionally be found at the same site, as the ones shown here had been. 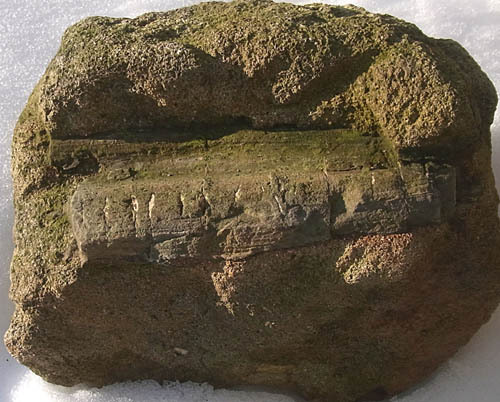 Fig.1 (left): Lower Permian tuff found as a loose block, slightly rounded, with embedded coniferous-type wood with shrinkage cracks filled with some white mineral. Length of the wood fragment 18cm. 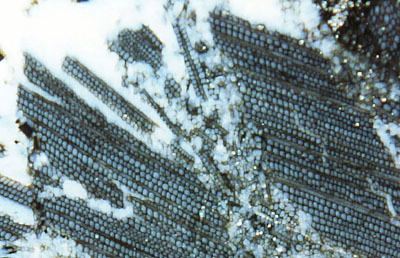 Fig.2: Lower Permian coniferous-type wood in white chalcedony, apparently torn asunder while lying in water in a soft degraded state. Width of the picture 4.5mm. As another way of silicification in the aftermath of volcanic activity, hot springs can provide mineral-rich water for millions of years, which may result in numerous ponds and swamps in ever changing positions . Such scenario had created the stack of dozens of fossil-rich chert layers between sandstones, shales, mudstones, and siltstones at the famous Rhynie location . Volcanic ash falls, other than lava flows, are caused by explosive eruptions of magma containing large amounts of bound gases which are released as soon as the pressure decreases as the magma ascends. The explosion due to escaping gases can be so violent that the magma is scattered into a big hot cloud of very small droplets. What comes next depends on the average density or weight per volume of the cloud. With the low-density hot air and water vapour between the droplets, the density of the cloud can be less than the density of the surrounding air. In this case, the cloud ascends and slightly cools by expansion until an equilibrium is reached where it keeps floating while the droplets fall out like raindrops from a rain cloud and arrive on the ground as volcanic ash. If the cloud is heavier than air, it plunges down, flows down the slopes and keeps flowing at high speed, driven by its momentum, over level land and even uphill, flattening everything in its way. The strong turbulence of the flow prevents most of the droplets from falling down. As soon as the flow has become too slow to sustain the turbulence, the droplets simply settle down so that the avalanche is reduced to hot air. Such phenomena, known as pyroclastic flows, can tear off and carry away branches, upset tree trunks, and blow away whole swampy habitats. This may be one reason why big petrified tree trunks are often found lying by themselves. A few additional considerations may be appropriate here. In some publications the damage caused by the avalanche-like flow is ascribed to the explosion pressure wave * of the eruption. The power of the bang from an eruption spreads mainly upward and decreases rapidly with distance while the power of the flow keeps concentrated and thus reaches farther. As a simple argument, a pressure wave spreads with the velocity of sound, which is about 1200km/h, but the velocity of the spreading damage had been reported as varying between about 400 and 1000km/h, hence the phenomenon cannot be called a wave. An avalanche carrying along with it a pressure distribution is not a pressure wave, and also the moving pressure field of the avalanche taken by itself is not a pressure wave. It appears that some volcanologists use the term "wave" in a colloquial sense also for flow phenomena without a real wave, which impedes deeper comprehension. Some geologists refer to those volcanologists when they do the same . A more sophisticated but likewise inadequate construct is the sidewards directed explosion pressure wave, occasionally offered as the cause by which the wood on one side of Mt. St.Helens was flattened, and even as the cause of the asymmetry of the whole mountain after the big eruption in 1980. In fact, first came the mountain slide which brought about an asymmetry, then the asymmetric eruption and subsequent pyroclastic flow. Another questionable item is the simplistic explanation of the explosiveness of volcanos as being caused by groundwater. Such causal connection seems plausible at first but not so after a second thought. It is tacitly assumed by some volcanologists that contact between magma and water makes an explosion. This idea seems to be based on only one observation: A drop of water explodes when it falls on a red-hot plate. By doing it the other way round, or simply by imagining how it would work out, one comes closer to the magma problem: Dropping the red-hot plate into the pool does not make an explosion but only boiling water, the same as magma does when flowing into the sea. Also one can easily imagine how groundwater behaves when in contact with magma: It recedes, driven back by vapour through the porous aquifer, away from the magma and kept there at a distance. Eventually fluids released by the magma will enter into the porous layer where the water had been and deposit minerals there. There are drawings by volcanologists illustrating how the water allegedly flows from an aquifer right into the magma of an active volcano, where it is supposed to increase its explosiveness. (This view is held up at the Steinmann Institute Bonn and elsewhere .) In reality, explosive magma results from molten sediments whose minerals contain crystal water. This water content keeps dissolved in the magma under pressure but is released as vapour as soon as the hydrostatic pressure reduces as the magma ascends, which may result in a pyroclastic flow as described above. Samples: found near the upper end of a field which is now the golf course at Wilmsdorf in the Lower Permian Döhlen Basin near Dresden. The tuff with embedded wood was found by Sieglinde Weiss. Annotation 2014: To those who find the views of physics difficult,"explosion pressure wave" is still a suggestive term suitable for an explanation of the destructive power of an eruption. C.M. Rice et al. : A Devonian auriferous hot spring system, Rhynie, Scotland. J. Geol. Soc. London 152(1995), 229-250. R. Rössler: Der versteinerte Wald von Chemnitz. Museum für Naturkunde Chemnitz, 2001, 182-191.